It’s no secret that when remodeling your master bathroom, there are numerous choices and decisions to make. The size, shape, style and arrangement of each feature is obviously one of the biggest concerns. And finding ways to fit everything into the space seamlessly can seem practically impossible. So why not eliminate the bathtub? Many designers often regard the shower as the centerpiece of the bathroom, or “the star of the show.” Homeowners looking to upgrade their bathroom right now should definitely consider how a new or upgraded, spacious shower could enhance their bathroom overall. 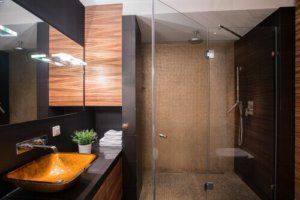 More and more consumers and remodeling professionals are in agreement: many homeowners are leaning away from tubs in favor of spacious showers with multiple heads and features. In fact, in a recent survey conducted by Houzz, over 84 percent of master bathroom remodeling projects last year included an upgrade to the shower. While overall bathroom size pretty much remained steady, 67 percent of respondents upgrading master showers are increasing their size. Recent innovations in shower design have led some homeowners to opt for a luxury item that can be used every day. Many showers today are more expansive, and can provide relaxing and soothing elements, like multiple body sprays, rainfall shower heads and sometimes even steam. Glass can definitely brighten up a small bathroom, make it seem bigger, or simply add a touch of class. When it comes to shower doors, “less is more,” and installing a frameless door can eliminate any unsightly thick metal framing that comes with traditional framed doors. At Republic West Remodeling, we believe it’s important to choose the right bathroom renovation in Scottsdale contractor because selecting the wrong one can lead to wasting precious time and money. Call us today for more information.